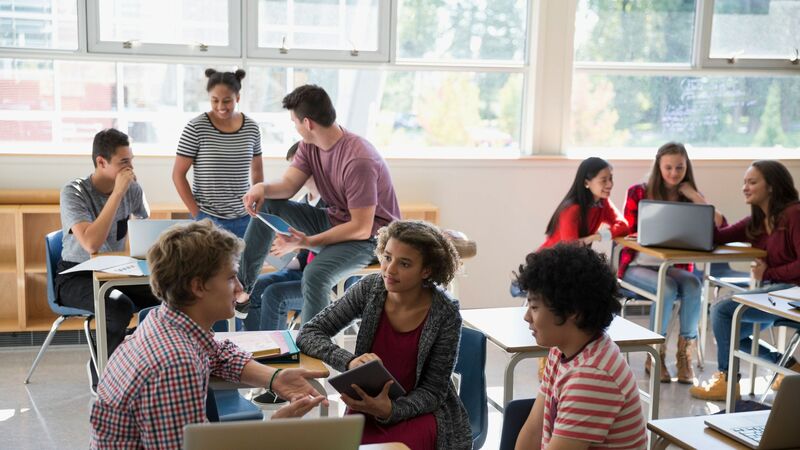 A neuroscientist explains how factors such as light and seating arrangements can affect students’ cognitive performance. If you’ve ever attempted to clear your head by taking a walk outside or zoning out by a window as the clouds roll by, you’ve intuitively hit on something that scientists have been researching for years: Our natural and built environments seem to affect how we think and feel. Researchers have recently focused on determining how environmental factors can affect kids’ ability to learn. Studies show that a well-designed learning environment supplements evidence-based pedagogy and curriculum design. Let’s examine four environmental factors that can enhance or hinder learning. Light does more than just allow us to see the world around us. When light enters our eyes, it also engages a non-visual system that affects the timing of our sleep-wake cycles and our cognitive performance. In fact, parts of our eyes connect directly to a part of our brain that secretes hormones influencing our levels of sleep (melatonin) or alertness (cortisol). Even more importantly, all light is not the same. While the presence of any light can influence hormonal secretion via this non-visual system, blue light has the most powerful effect. People are more alert and less sleepy when exposed to blue light versus other wavelengths. Sunlight, full-spectrum LEDs, and most digital screens are rich in blue light. One study of 21,000 U.S. elementary students showed that, over one school year, kids who were exposed to more sunlight during their school day displayed 26 percent higher reading outcomes and 20 percent higher math outcomes than kids in less sunny classrooms. However, even if your classroom has less natural light than you’d like, other studies have shown that replacing your artificial lighting with blue-enriched bulbs can improve students’ cognitive performance. Daytime blue-light exposure may have a powerful effect on adolescents in particular. Biological changes during puberty delay the sleep-wake cycle by shifting melatonin secretion to later in the evening (making it harder for teens to fall asleep early) and later in the morning (making it harder for teens to wake up early). This means that teens often accumulate sleep debt during the week, which has negative effects on academic performance. First, it leaves them less alert and able to pay attention during the school day, and therefore less able to learn. Second, the quality and quantity of sleep are affected, interfering with the brain’s ability to store the day’s learning. Later school start times can help reduce these challenges, but blue-light exposure throughout the school day may also help. Light resets the body’s circadian rhythm, so exposing teens to light can increase their alertness and improve academic outcomes. Given that American teens spend an average of nine hours per day using digital media (not including media time for school or homework), there are growing concerns about the blue-light exposure from all of this screen time. If such exposure happens as kids are preparing for sleep, the blue light may be compounding the sleep disruptions caused by asynchrony between school start times and their delayed sleep-wake cycles. By disrupting kids’ sleep patterns, blue-light exposure before bed also interferes with learning by leaving them sleepier and less able to learn the next day, as well as by disrupting the storage process of the day’s learning that occurs during sleep. In fact, one of the easiest ways to boost learning is to improve the quality and quantity of sleep (and by putting some sleep between studying and testing). Reducing pre-bed screen time can effectively maximize sleep’s benefit on learning. Think your student is spacing out when she’s gazing out the window during class? She may be instinctively seeking a cognitive reset that will improve her ability to focus. Many studies have demonstrated the power of the natural environment—whether real or simulated in video games—on kids’ learning and well-being. One study of over 10,000 fifth-grade students showed that kids in schools with unrestricted views of nature tested higher in reading, math, and language arts than students in schools with urban views (or no views at all). Other studies have shown that interaction with nature can be particularly helpful for kids with ADD and ADHD, and that the greener the child’s play spaces, the more reduced his or her attention deficit symptoms. Again, don’t worry if your classroom or child’s bedroom lacks views of nature. In a 2009 study, researchers introduced leafy plants into the classroom and found a positive impact on students’ well-being and behavior, with fewer hours of sick leave and disciplinary events. The many factors that make up classroom design have been studied for their influence on learning. Factors that can interfere the most with learning are noise, temperature, and (surprisingly) seating arrangement. 1. Noise: The interfering effects of noise during learning—particularly noise that includes voices (language)—is quite profound in young children. The likely reason is that the brain systems which allow us to filter out distractions and focus on the task at hand (executive functioning) are still developing in children. Thus, children are particularly vulnerable to the acoustics of noise. Because noisy interference makes it difficult for kids to stay on task, it has widespread effects on learning. Noise has been shown to profoundly impact reading, writing, and comprehension skill learning, as well as overall academic performance. 2. Temperature: If the temperature of a classroom or home studying environment is outside of a comfortable range, it can be a source of distraction that interferes with learning. A review of studies investigating the relationship of temperature and learning outcomes revealed ideal thermal ranges for optimal learning: between 68 and 74 degrees Fahrenheit, with about 50 percent humidity. 3. Seating arrangement: Another source of distraction can be a classroom’s arrangement of desks and chairs. In a classic study, researchers tested three seating models with different levels of independent versus interactive arrangements. They showed that elementary school students were least on task when desks were arranged in rows, better on task when arranged in clusters, and best on task when in a semicircle. Another study, however, suggests that the best arrangement should be determined by matching it with the task at hand: More interactive tasks benefit more from interactive arrangements (semicircle and clusters), and independent tasks from independent (rows) arrangements. In sum, there are many things about the built and natural environments that can impact student learning, with some researchers suggesting that 10 to 15 percent of variance in academic outcomes is influenced by the environment.